Portable and lightweight units are easy to position where needed most. 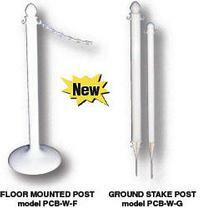 Choose either floor-mount or ground-stake (Pic. 4) design depending on application. Chain simply snaps onto post hooks (two hooks per post). Three standard colors to choose from: white, yellow and black. Units are easy to assemble with snap-together parts. 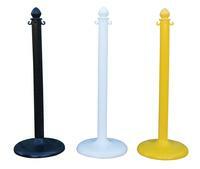 Posts are sold four (4) to a box. Chains(Pic. 3) sold in rolls.